They got a lot more expensive. $80! 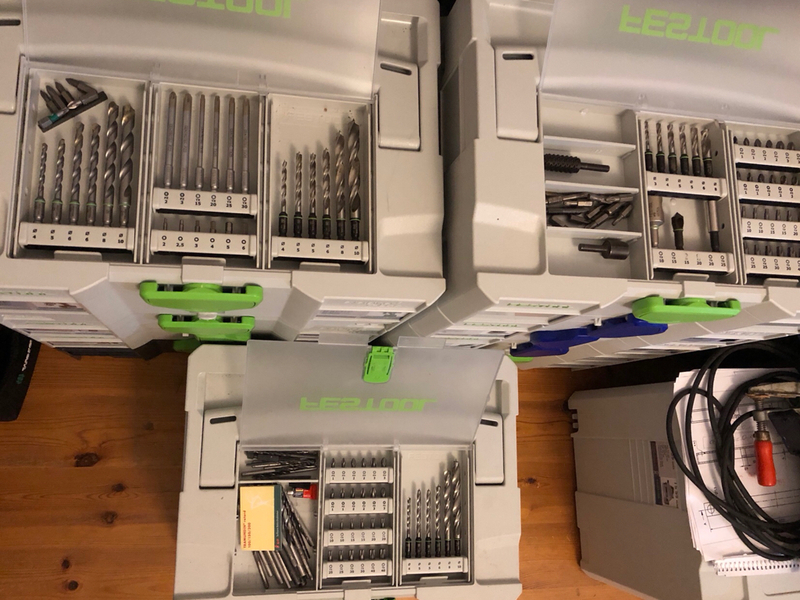 Festool products are getting ridiculous. And filled up my attics to my liking. Top left (with stone drills) is PDC, Bottom is C18 and top right (short wood drills) is CXS. I will check if this is really the final setup, but I am quite confident it will cover my basic needs for these drills. The others are at the shop, but I found a very special limited edition on my dining room floor. Does anyone else find it hard to pull bits (especially short ones) out of the attic lid insert holders? Initially, yes. Especially the smallest hex bits. They loosen up over time, and settle down to a perfect tension. Takes a few months to a year. 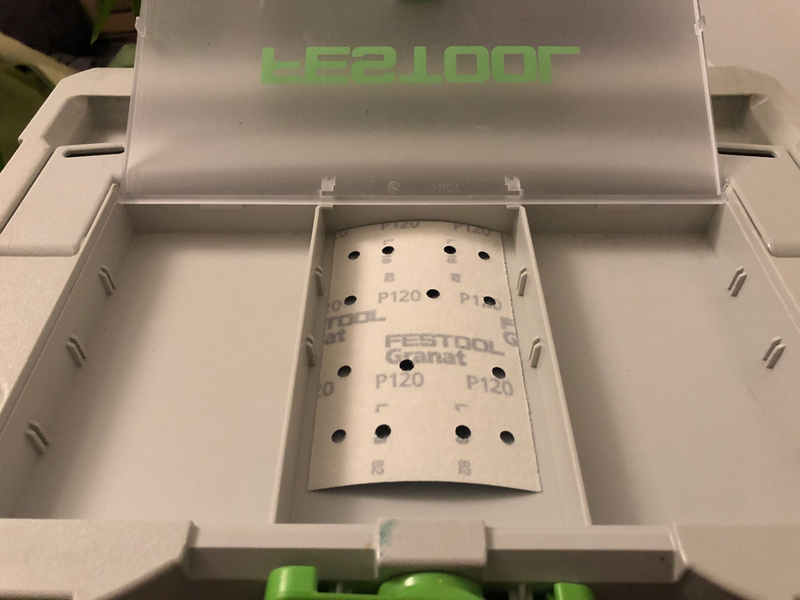 The loaded inserts I've gotten from Europe/UK didn't have the same initial "too snug" problem (Whether it was NOS Protool or fresh from the carton Festool). For the drill/drivers, I pretty much must have the driver bits in those attic trays. I've grown very fond of it. Drill bits and all of that...not so much. For a while I was doing the attic lid on a sys combo, with drill bits and screwdrivers and socket sets crammed in the drawers (spread across the T18 and PDC). That proved to be a tad too ridiculous and heavy. The Milwaukee drill holders are ridiculously tight as are their multi-tip, screwdrivers, torx, and allen screwdrivers. I always have my Leatherman with me, but it is a pain to have to use it to remove and reinsert bits. I took a drill bit to the Milwaukee drill holders...made them just a tad oversize. They're a lot easier to use now, still snug but you don't need a pliers. That is good to know. I will now do the same as I recently "centroteced" two of the Milwaukee drill sets and have cut my fingers trying to remove those bits. Sorry about your fingers... it is nice to know though that my concerns were justified. I always had this vision of trying to remove a drill bit, then getting that creepy paper cut feeling and finally seeing the nice gold TiN surface turn red. I’m always amazed how the ‘little’ details get lost for some of our tool purchases. Your're right...but what's so annoying about this particular issue is that the ends of the drills are all the same size, they use a standard 1/4" hex. So Milwaukee had 29 chances to get the fit correct and they blew it 29 times. I expect they’d say it works okay with the large bit. I keep a dull utility knife blade in my kit to lever the small bits out. Might might switch to reaming as you suggest. There is one bit casette that rules them all. I got a new RTSC 400 today and had an epiphany on the weekend. I figured, I could just as easily take the attic for sandpaper storage and not have the bulk of an extra Systainer or a SYS-Combi. Since the sander only comes with one sheet, I could only make a quick dry fit. I am not sure how many sheets fit but I set one up for my hand sanding block with hose. I don' have any systainers with attic storage. My 18V milwaukee fuel hammer drill fits into a T-LOC I and has plenty of storage available for bits and drill bit carrier boxes. and some hole saws. Smaller T-LOC I height beats T-LOC 2 height with attic storage and besides hole saws don't fit into an attic and some long masonry drill bits won't fit either. I'm looking for best way to organize drill bits. I gotta get my hands on clear round tubes in which Hilti sells a lot of their drill bits.